Here is a small selection of some of our more recent projects displaying the wide range of work we can undertake. We keep this regularly updated so please come back for more exciting examples of work! 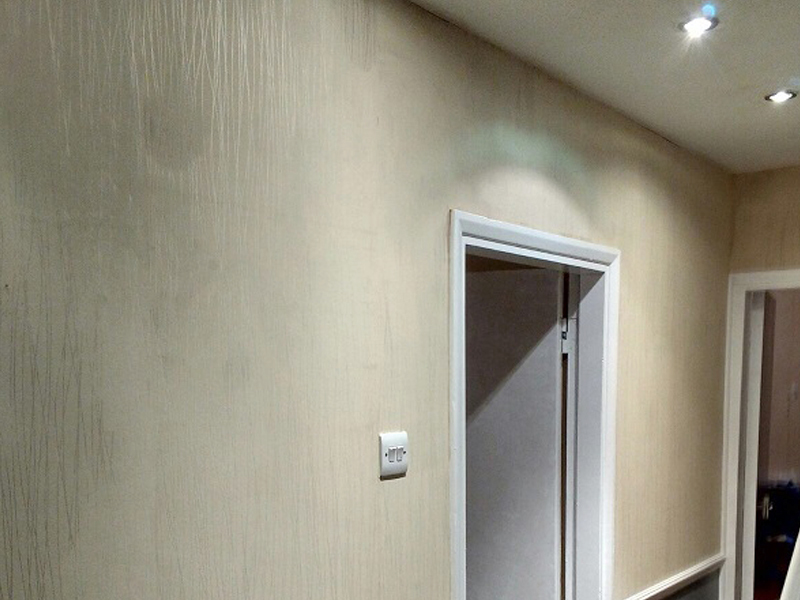 If you have a project in mind please feel free to get in contact and we can send you pictures of some of the work we’ve done in that specific area to give you some inspiration for your job. A full downstairs internal redesign – We knocked through 2 walls and moved a doorway to create a fully open plan living area. 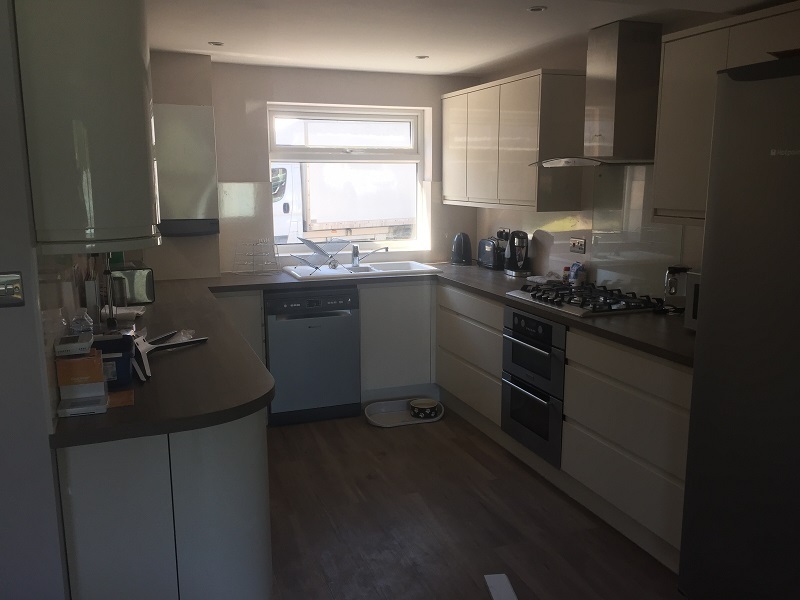 We fitted a new Howdens kitchen, plumbed in a complete underfloor heating system and finished with Karndean luxury vinyl flooring. 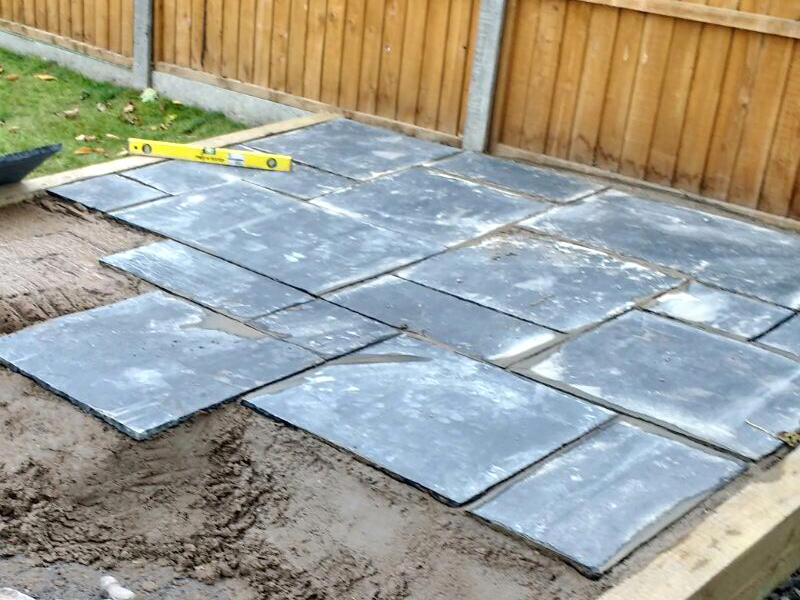 Garden patio extension – Here’s an example of one of our smaller jobs. 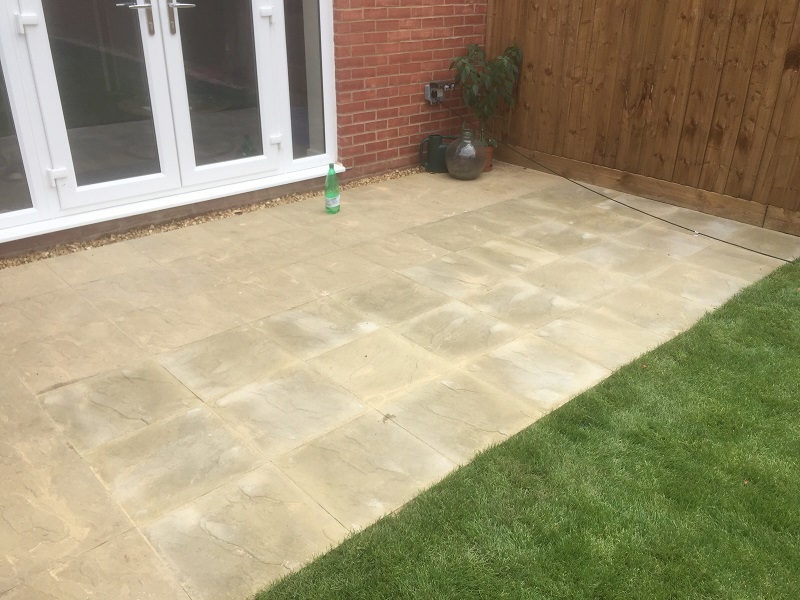 Our customer had just moved in to his new build and simply wanted to extend the existing patio. We were more than happy to oblige and got it finished over a weekend just in time for a BBQ in the sun! 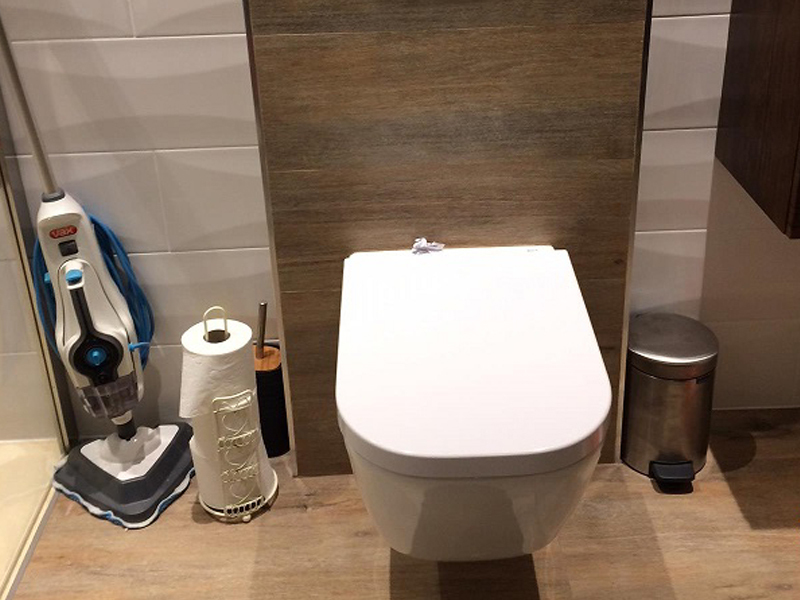 Bathroom fitting – This picture is part of a larger job involving a complete rip out and redesign of the family bathroom and new a completelely new ensuite formed in the large Master bedroom. 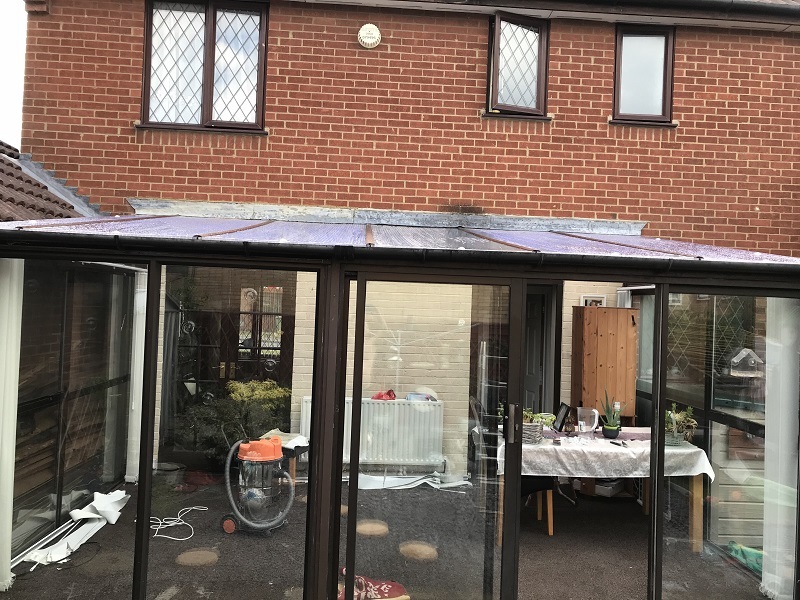 Polycarbonate roofing – Our customer had their conservatory built over 20 years ago and the existing roofing had gone cloudy and developed leaks. 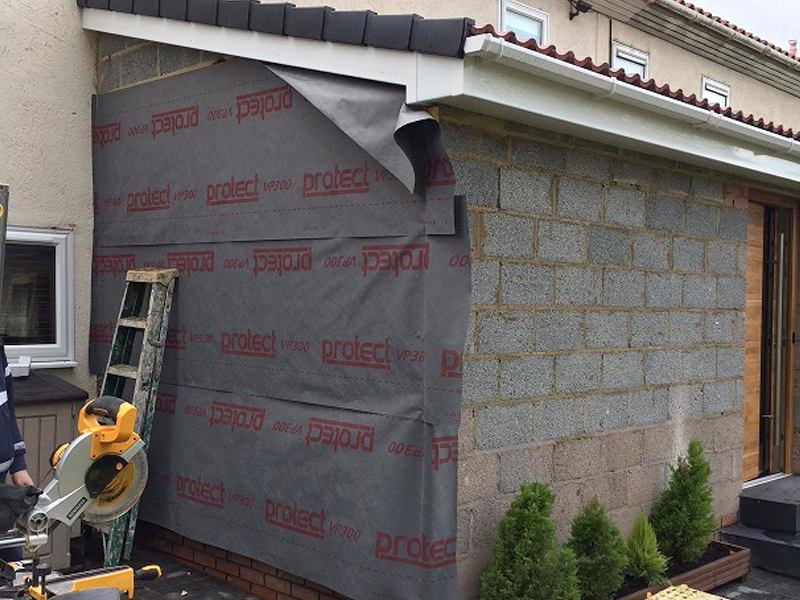 We replaced it with some new clear polycarbonate roofing sheets and glazing bars. 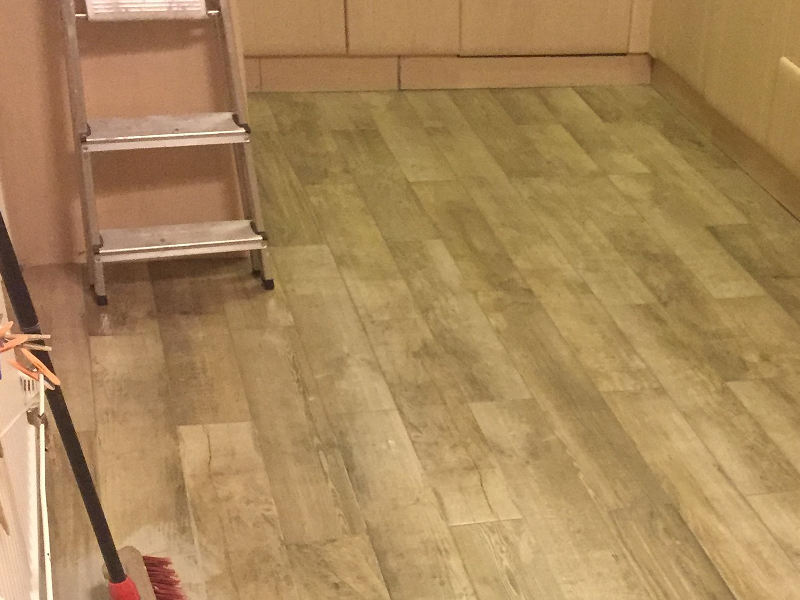 Wood effect floor tile and underfloor heating – Long panel wood effect tiles laid through the kitchen and utility room with electric underfloor heating to keep feet warm! 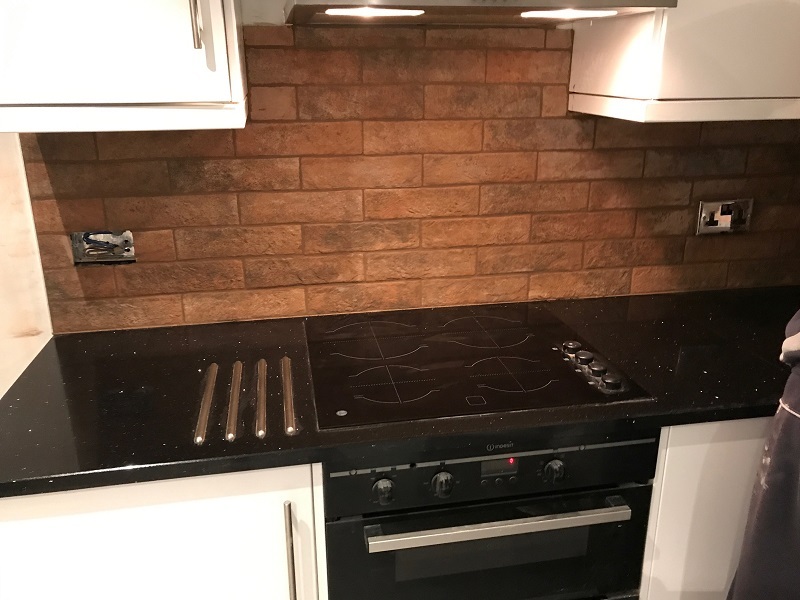 Kitchen wall tiles and cabinets – Small textured brick effect tiles around the kitchen splashback area with custom fitted white gloss cabinets. 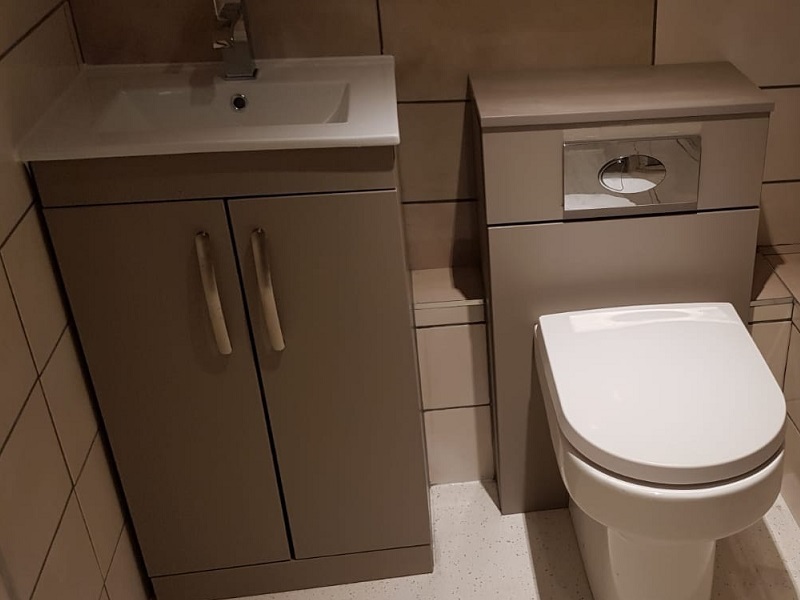 Bathroom fitting – A great finish on this bathroom refurbishment, new toilet with rear box to hide all fittings finished in wood and with patterned tiles at the back catching the light from the new downlights. 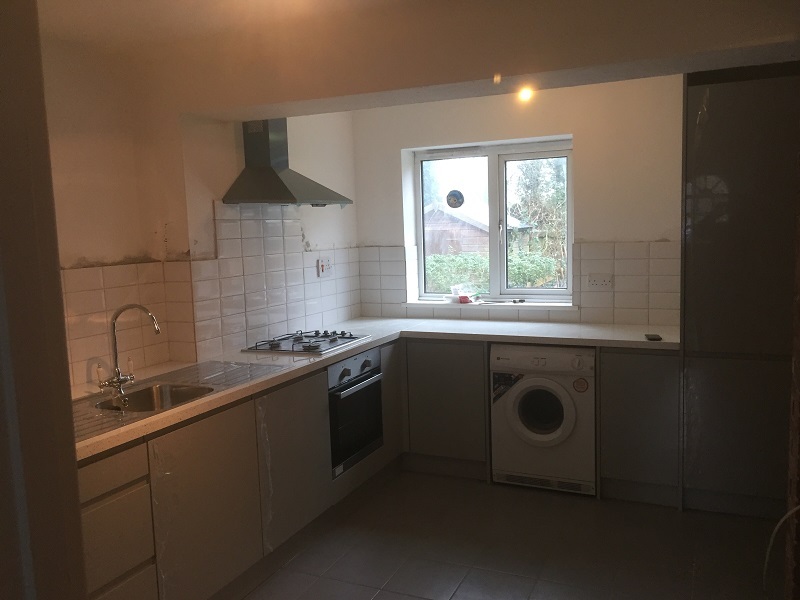 Kitchen fitting – A complete kitchen refit, with grey silk floor tiles creating sweeping lines with the grey gloss cabinets and a crisp white gloss tiled splashback. 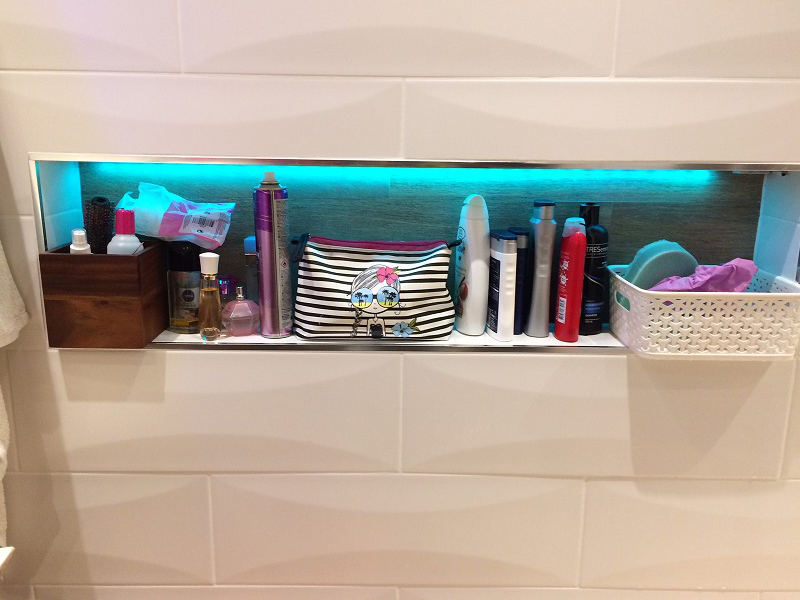 Tiling with built in storage – A small section from a newly tiled bathroom wall highlighting the cut in storage alcove with built in mood lighting. 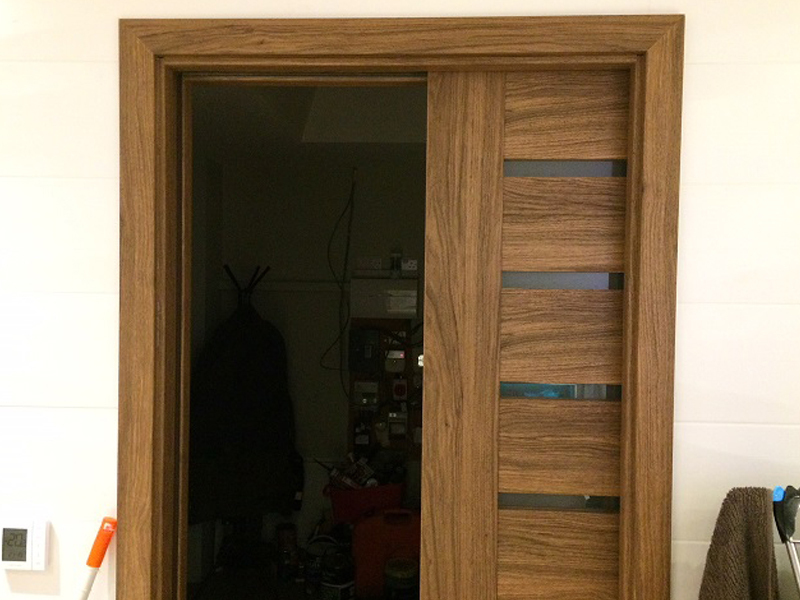 Sliding internal door – One of the features in a full house renovation; highlighting the new door frame and hidden sliding door. 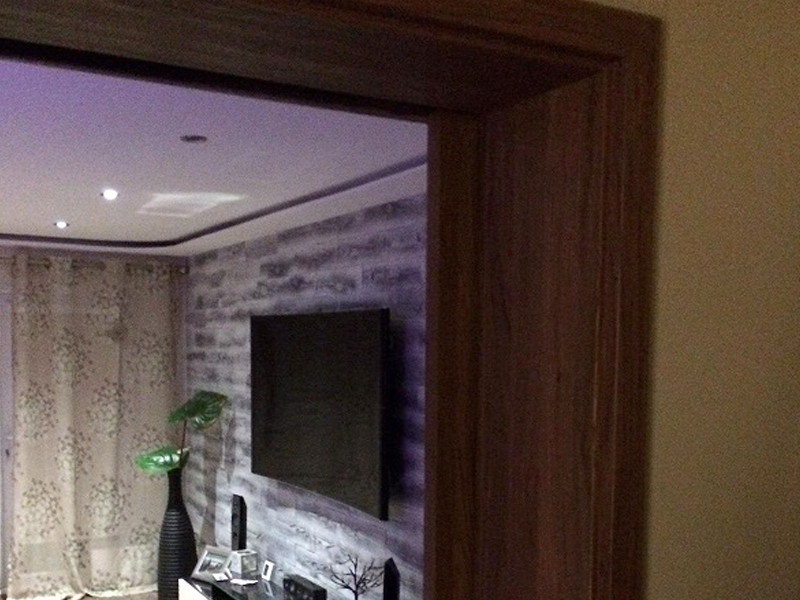 Sliding door and feature wall – Another new door frame and hidden sliding door in a large whle house refurbishment with feature wall decorating in the background. 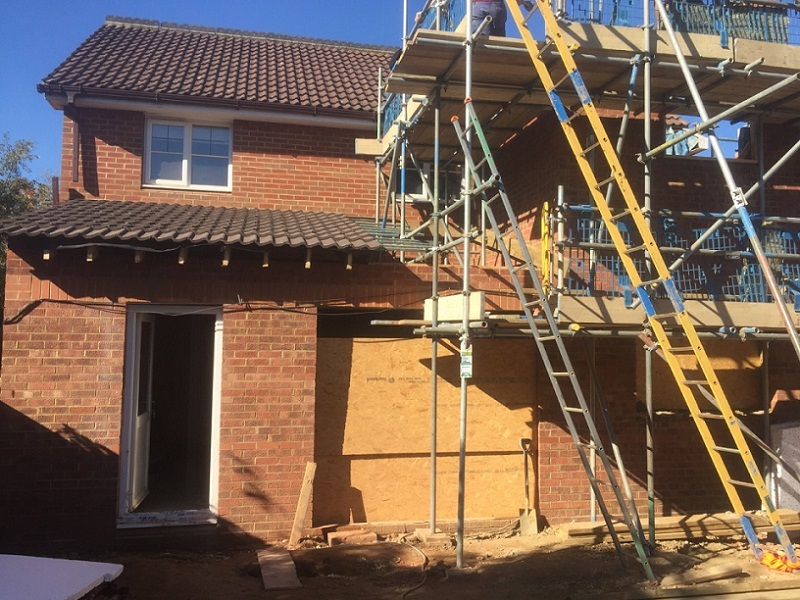 Two storey extension – A large 2 storey extension with new brickwork, roofing, carpentry, plastering, kitchen installation, luxury vinyl flooring and decorating. 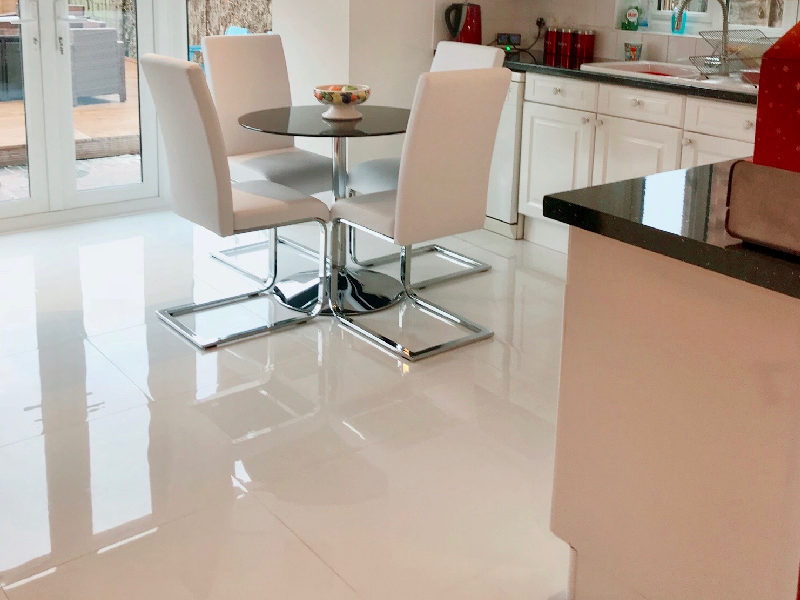 Kitchen renovation – Brilliant white gloss porcelain tiles alongside a new gloss granite effect kitchen worktop really gave this kitchen the wow factor. 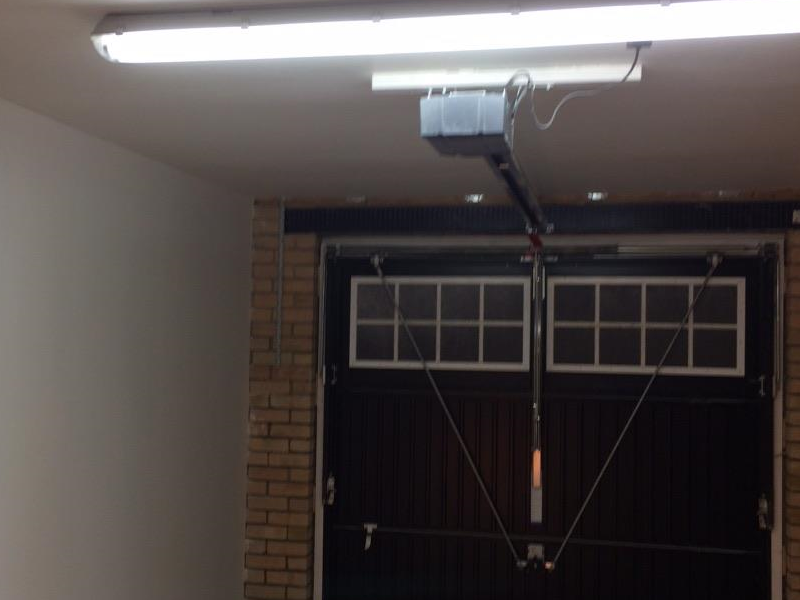 Garage conversion – New walls, and ceiling with insulated cavities, lights and sockets installed and sealing of the floor to create a new home gym area. 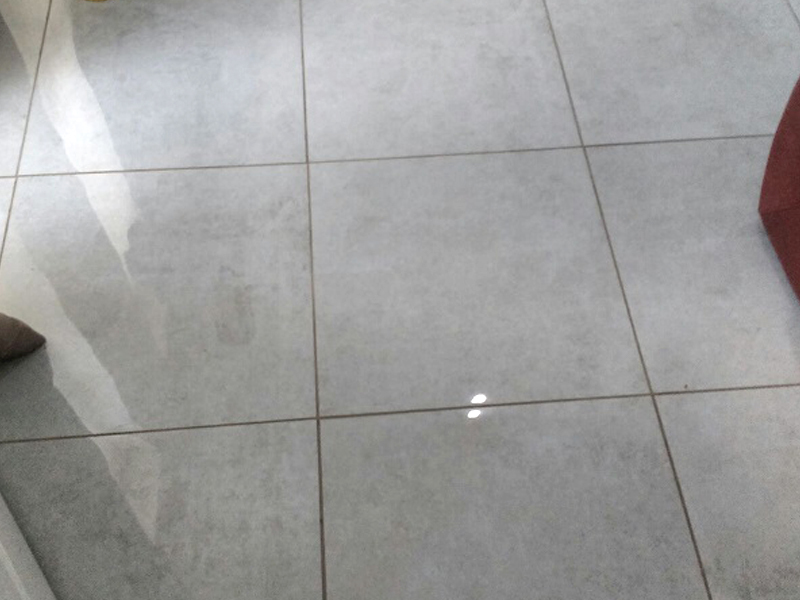 Living room floor tiling – A nicely finished living room tiling job, using large 600 x 600mm tiles with the tiles cut in to match the existing tile lines from the kitchen and hallway. 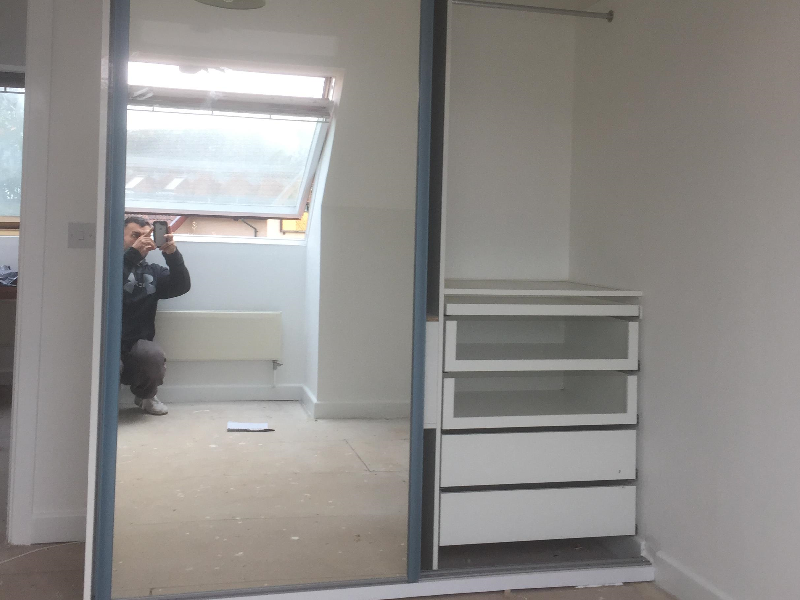 Fitted mirrored wardrobe – One of 3 fitted wardrobe at this customers house. With mirrored sliding doors, glass drawers and internal sensor lights. 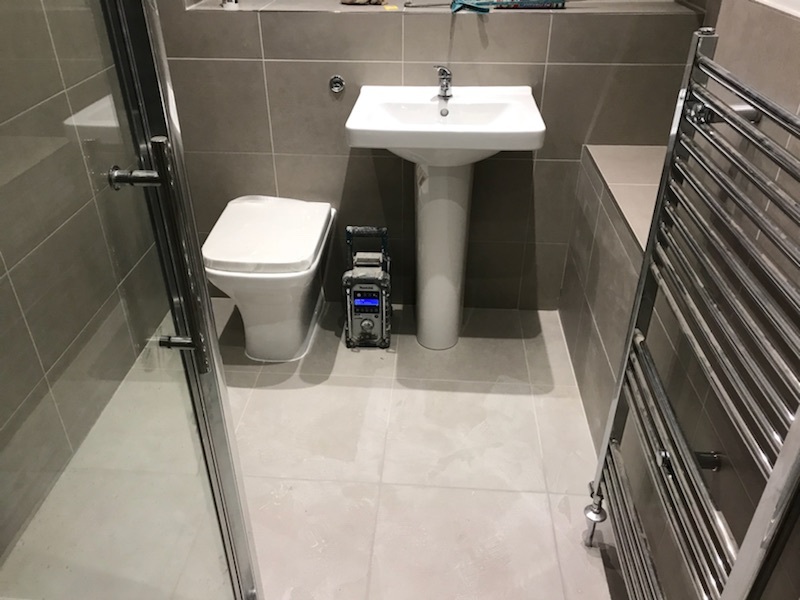 Disabled shower room – We installed this new walk in shower room with disability access in mind, a raised height WC, large shower and carefully positioned grab rails. 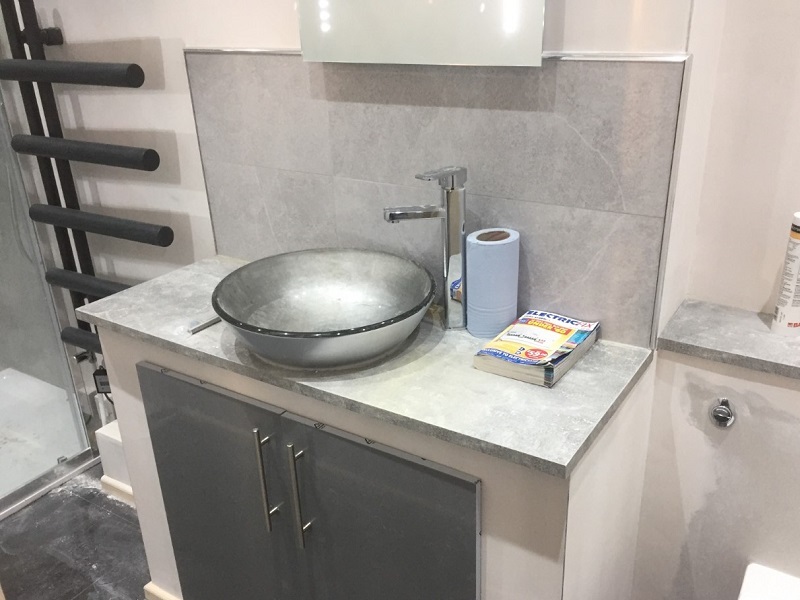 Bathroom refit – A great finish on this full bathroom refit featuring a concealed cistern toilet, large walk-in shower, tiled surfaces and custom fitted shelving. 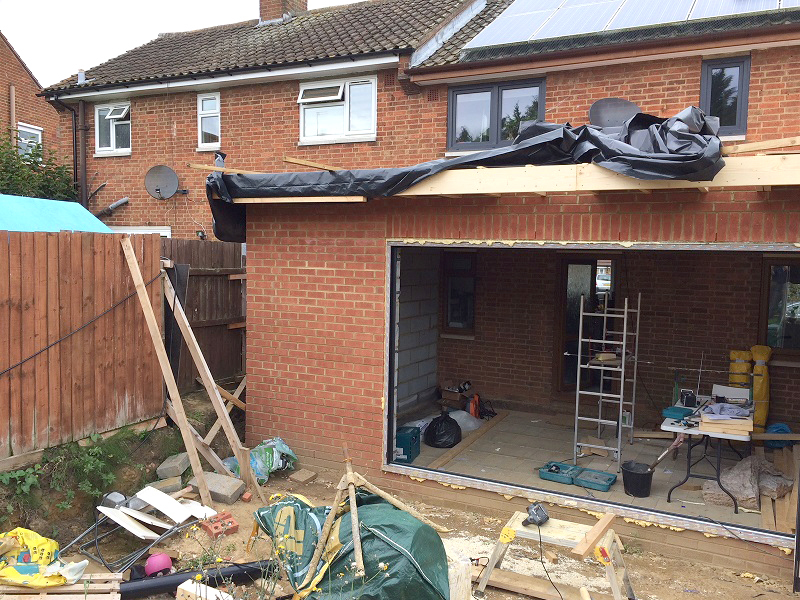 Home extension – A front of house extension in mid progress used to create an extra living space to raise the value of the property. Backgarden home extension – Mid point through a large scale home extension into the backgarden. 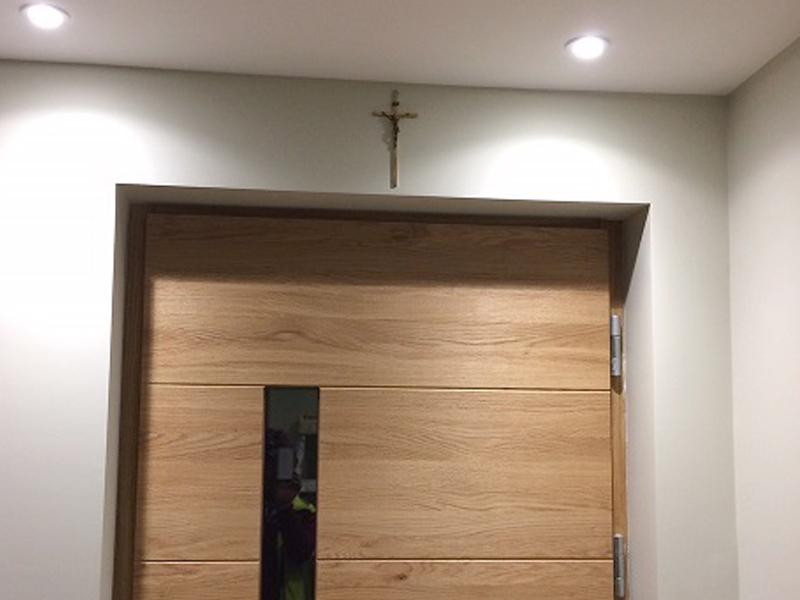 New door with lighting installation – A new door and frame installation with downlights wired in to give a great finish. 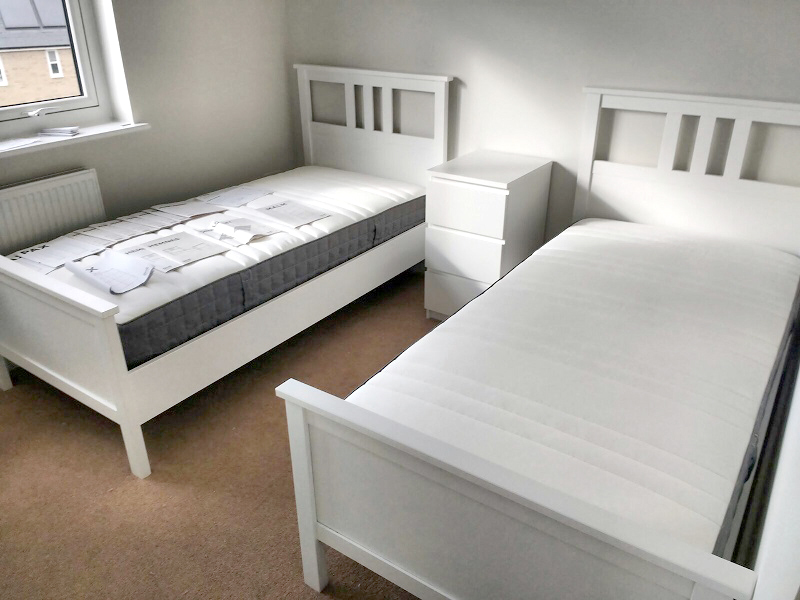 Flatpack furniture bed assembly – A nice example of the twin beds from a full house furniture assembly job. 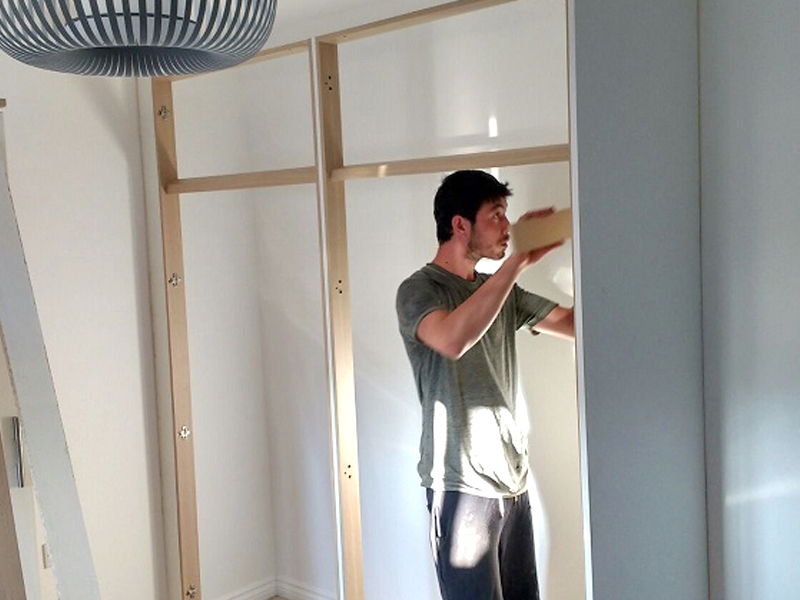 Fitted wardrobe – The internals from a large custom fitted wardrobe. Finished with hidden mirrors and trouser racks and internal sensor lights in the larger compartments. Garden paving – Halfway through a feature ‘courtyard’ style mixed limestone patio paving section, trimmed by railway sleepers..
Painting and decorating – A small section of a larger decorating job; cream textured wall paper, with silk pewter paint with all frames and rails finished in high gloss white. 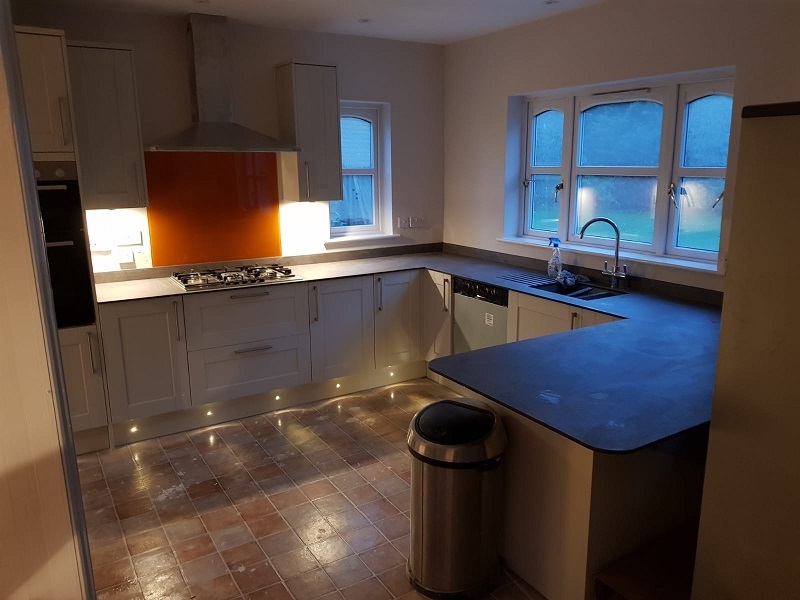 Kitchen refit – Part of a larger internal build project, this new kitchen featured a mechanical waste disposal, plinth lighting and boiling water tap. 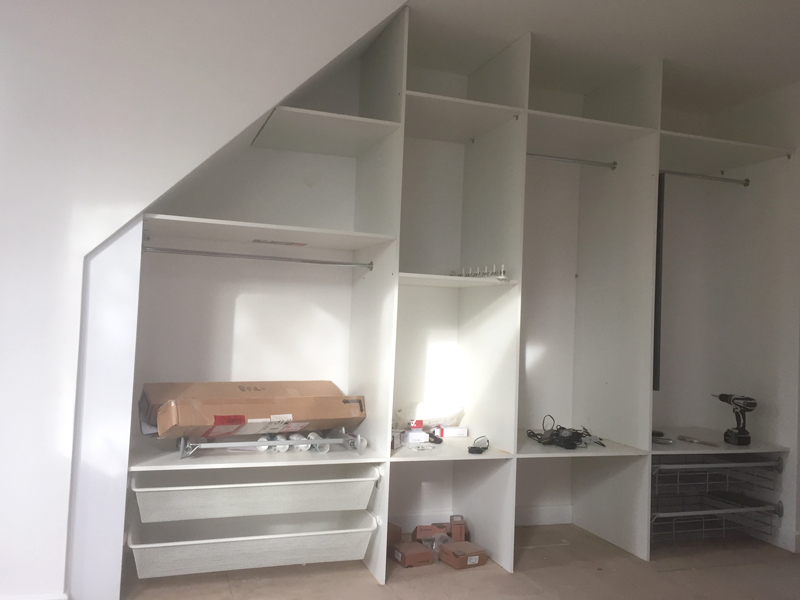 Fitted wardrobe and light installation – A custom fitted bespoke wardrobe fitting for a customer who we also installed several new pendant light fittings for. 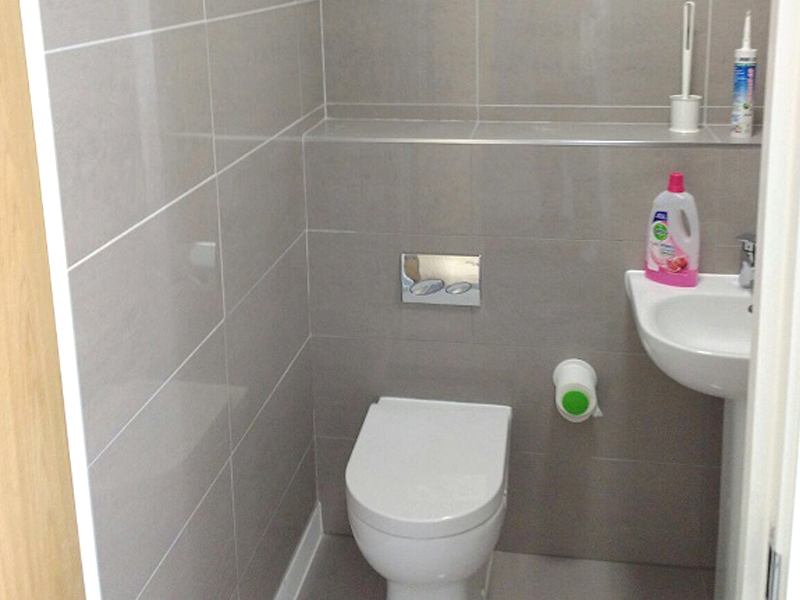 Bathroom tiling – An installation of floor to ceiling bathroom tiles, fitting of new sink, toilet and towel radiator (out of shot). 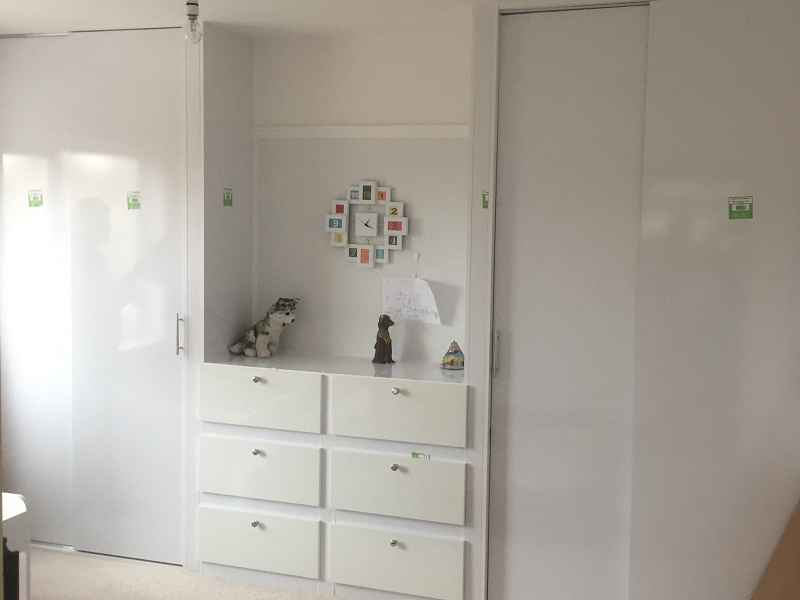 Fitted furniture – Maximising storage space, we designed and built this double sliding wardrobe and chest of drawers in gloss white. 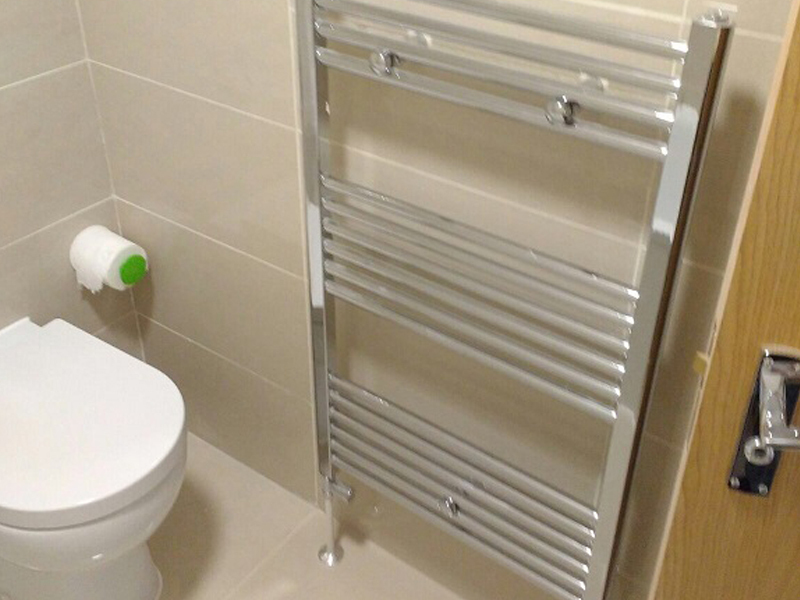 Towel radiator and bathroom tiling – A nice finish on this beige full washroom retile job including the fitting of a new towel rail. 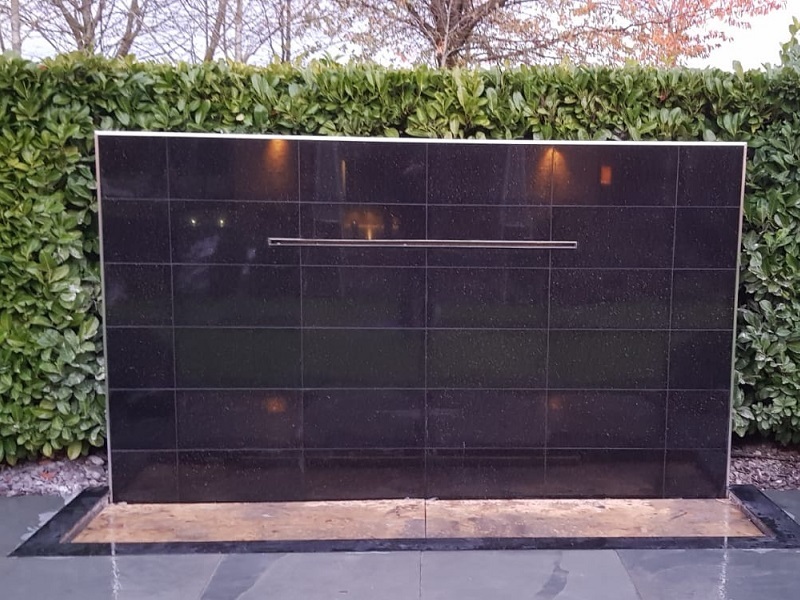 Exterior tiling – A great finish to this newly tiled exterior garden water feature, in top quality black granite tiles to really impress. Please contact us for a free quote and for any other information you may require. 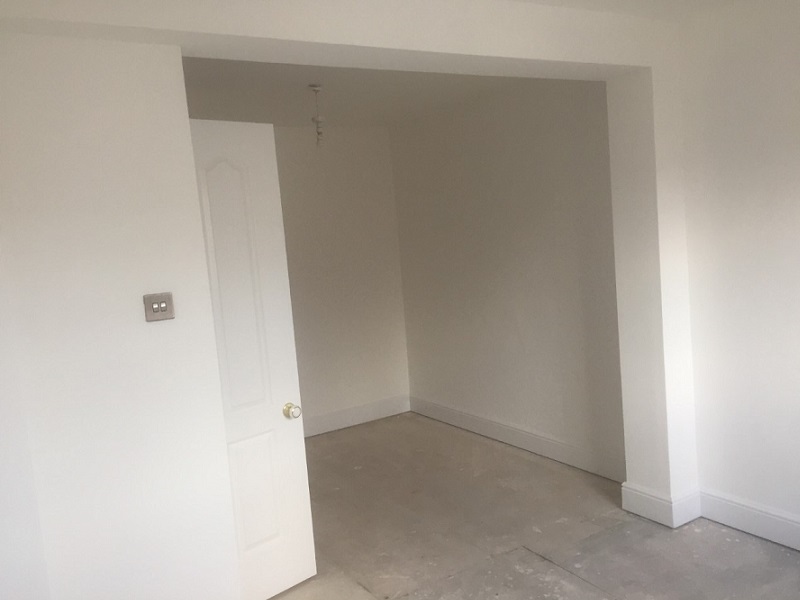 If you’ve been searching for an experienced, reliable and friendly tradesman for a wide range of home and garden improvements or handyman services, then look no further!